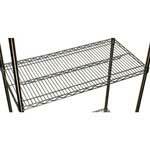 Extra shelves for stainless steel wire shelving bays. The shelves are designed to be used with our Stainless Steel Wire Shelving and are additional shelves for extra storage. The Stainless Steel shelving is an adaptable system allowing additional shelves every 25mm so these shelves are perfect to accompany your bay of shelving and offer additional storage.